Light up the night with up-lighting! Properly placed lighting will transform any room or outdoor setting from ordinary to extraordinary. Setting the mood at your event is very affordable. We will be happy to meet with you at the venue to discuss light placement and gel colors (over 250 styles to choose from!). Additionally, we also offer custom gobos with the bride and groom's names or initials to be shown on the wall or the dance floor. 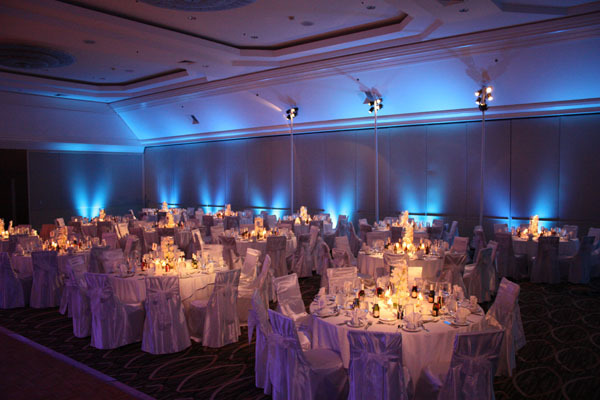 Pin spotlights are generally positioned in the center area between several tables to illuminate the table surfaces. They can also be used for highlighting cake tables, food stations, or any area where more light is needed. Cylinder lights can also be used for areas that need wide coverage. These lights should be considered for any private home event, especially backyard parties. We can provide light shields with custom coloring to match the surrounding environment or decor of your event.